All nine members of the Bank's Monetary Policy Committee (MPC) voted to keep rates at 0.75%, where they have been since August last year. In the meeting's minutes, the MPC said the economic outlook would continue to depend "significantly on the nature and timing of EU withdrawal". 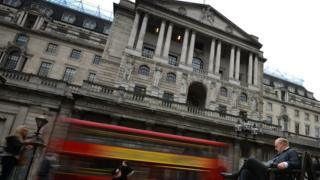 The MPC's response in terms of interest rates could be "in either direction". What did the Bank's policymakers say? In setting interest rates the Bank is aiming to keep inflation within 1% either side of its target of 2% "in a way that helps to sustain growth and employment". The inflation rate in February was 1.9% and is expected to remain "close to the 2% target over coming months". In the minutes of its latest meeting, the Bank said that predictions contained in its February inflation report "appear on track". The projections were conditional on a "smooth adjustment to the average of a range of possible outcomes for the UK's eventual trading relationship with the EU". It added that the economic outlook would continue to "depend significantly" on the nature and timing of EU withdrawal. In particular it highlighted the "new trading arrangements between the EU and the UK; whether the transition to them is abrupt or smooth; and how households, businesses and financial markets respond". "The appropriate path of monetary policy will depend on the balance of these effects on demand, supply and the exchange rate. The monetary policy response to Brexit, whatever form it takes, will not be automatic and could be in either direction." Mike Jakeman, senior economist at PwC, said the most notable aspect of the statement was how little had changed over the past month. "The global economy is slowing, the UK economy is still growing modestly, held up by consumer spending and dragged down by business investment; employment remains very strong and inflation around the Bank's 2% target. "As there are still a number of potential outcomes to the Brexit process, the Bank is keeping all options on the table, pledging that its next move could be in either direction." How are firms preparing for Brexit? The Bank found that the "cumulative effect of Brexit uncertainties" had hit investment by companies. Its data suggested that the level of "nominal investment" may be between 6-14% lower than would have been the case in the absence of Brexit uncertainties, with larger items such as machinery, equipment and buildings singled out in particular. The Bank warned that a short delay to Brexit could prompt firms to cut investment even more. A short delay may see a "larger immediate reduction", while firms hold off and wait for a deal to be reached. If the delay carried on for longer, it might have less of an effect on investment as businesses "judge it too costly to wait for any resolution to become apparent", according to the Bank. There was also further evidence that companies were continuing to stockpile, the Bank said, though the signs were that imports had risen strongly recently, so a lot of the goods were coming from overseas. According to the findings of a special survey carried out by the Bank's agents, about 80% of firms thought they were ready for a no-deal, no-transition Brexit scenario, against about 50% in January. However, "companies had continued to report significantly weaker expectations of output, employment and investment in the event of a no-deal, no transition Brexit". When are interest rates expected to rise? PwC's Mike Jakeman said given the "high anxiety" about the UK's future relationship with the EU, it was "inconceivable" the Bank would have raised rates this month. "However, its base assumption remains that a disorderly Brexit will be avoided and that in this outcome the economy will require a gradual tightening of monetary policy as slack gradually disappears. "We concur and expect the Bank to raise interest rates once in the second half of the year, if a no-deal Brexit is avoided." Andrew Wishart, UK economist at Capital Economics, said there were three "distinct paths" interest rates could take depending on what happens with Brexit. If Parliament passes Mrs May's withdrawal deal next week, the "elimination of uncertainty would support a strengthening in the economy". In that case, Capital Economics thinks the MPC could raise rates four times by the end of 2020, with the first increase coming in August of this year. However, if there was a no-deal Brexit next week, Capital thinks the MPC could cut rates to 0.25% at its next scheduled meeting in May, or even earlier at an emergency meeting.